This year Cork Harbour Open Day is set to be a great day with so much happening all around the harbour. Now in its third year, Cork Harbour Open Day has grown and each year offers more and more activities both on and off the water. The day itself is a great day for people to see exactly what Cork Harbour has to offer, and this year is no exception with the second largest natural harbour in the world will playing host to the Cobh to Blackrock sailing race, kayaking on the River Lee, crab fishing in Cobh, and for the first time a free open day at the National Maritime College of Ireland (NMCI) in Ringaskiddy and Fastnet Lines MV Julia open to the public for tours and lunch. 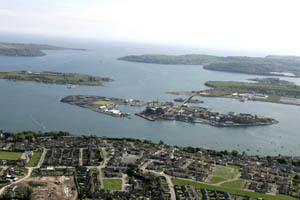 Cork Harbour Community Radio will broadcast throughout the day on frequency 98.3FM live from the NMCI. This community radio initiative is part of a response to the great sense of community developing in the Cork Harbour area and has been made possible by the combined effort and support of many harbour side groups and organisations. This year will also see the first ferry shuttle service operated by ‘Whale of a Time’ and sponsored by the Port of Cork and NMCI running in the lower harbour calling at Ringaskiddy, Monkstown, Cobh, Aghada and Crosshaven. Free to anyone who wishes to use it, this ferry will be a great way to see the harbour and get around to the different locations and attractions. Visitors to Ringaksiddy will be given the opportunity to go on a free guided tour around the National Maritime College of Ireland and see their panoramic bridge simulator, the survival pool and the marine workshops. Staying in Ringaksiddy, at the Deepwater Quay, Fastnet Lines’ MV Julia will open to the public giving people the chance to go onboard the ferry and even have some lunch if they wish. In the evening, Cork Corona Film Festival will hold a fundraiser themed the ‘Amazing Cork Maritime Experience’ at the NMCI from 5pm onwards. Tickets for this event are available here. In Cobh, Cunard’s MV Queen Elizabeth will make her maiden call to the Port of Cork and to coincide with this visit, Cunard and the Port of Cork have organised a Lusitania Memorial Service in Cobh led by the Captain of Queen Elizabeth. To add to the occasion, Band 1 Southern Brigade will play in the promenade after the service. Both events are free and open to all. In the afternoon ‘See You in Cobh’ will run a crab fishing competition for kids. The Irish Coastguard, RNLI and the Search and Rescue Helicopter will perform a search and rescue demonstration in the lower harbour near Monsktown and Ringaskiddy at 3pm. At 5pm when MV Queen Elizabeth departs a ‘Fond Farewell’ is being organised to encourage spectators around the harbour to wave this great ocean liner off as she departs Cork harbour. Great locations around the harbour to see the departure are Roches Point, Weavers Point, Camden Fort, Cobh town or Whitegate. Spike Island will be open to the public all day, with boat rides operating from Kennedy Pier in Cobh to the island throughout the day. Live music, face painters, clowns and jugglers will be on the island to entertain and visitors to the island are being encouraged to bring their own picnic for the day. In Crosshaven, the Rescue Camden Committee have organised a free open day from 12-6pm. The fort will host the Airborne 101 re-enactors and a weapons display and a ‘Port in Pictures’ photograph exhibition. Camden Fort is a perfect location to watch MV Queen Elizabeth as she departs Cobh at 5pm. Crosshaven will also hold their annual triathlon at 4pm. In Cork City, the Irish naval vessel L.E.Ciara will be open to the public for free tours of the ship from 11am to 4pm. Also in the morning visitors will get to see the amazing 150 cars taking part in this year’s Cannonball Run in aid of Barretstown Kids charity, as they depart Custom House quay at 11am. Blackrock Castle Observatory will present their theatrical tours bringing the colourful story of the castle to life from 400 years ago to present day. A great venue for all the family and a super location to watch the Cobh to Blackrock sailing race, as the yachts head up the river. In Aghada, there will be tales and stories of the south east side of the harbour throughout the day held in Rosies Bar. Visitors can use the ferry shuttle which would take them to Aghada’s new pontoon facility recently opened. Aimed at embracing what Cork Harbour has to offer, the Cork Harbour Open Day aims to raise awareness of the different activities available for people in the harbour both on and off the water. It’s a great day for all the family with many events free to everyone. The idea for a Harbour Open Day emerged from discussions between various stakeholders involved in the development and implementation of the Integrated Strategy for the Harbour. A group comprising representatives from UCC, City and County Councils and the Port of Cork set about working together to engage users of the Harbour and to organise the Open Day. For more information on Cork Harbour Open Day and see the full programme of events visit www.corkharbour.ie or email harbourevents@corkharbour.ie for information.